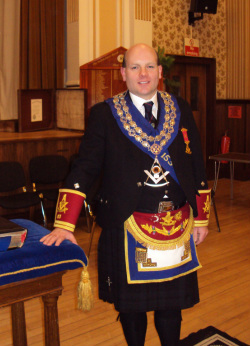 May I on behalf of the brethren of The Pollokshaws Royal Arch Lodge No. 153, extend a warm welcome to you and a big thank you for visiting our website. I extend a warm invitation to any Brother who is in the area to come and join us at one of our regular meetings – please see the syllabus section of the website for dates and details of Degrees being conferred. Our Lodge has the reputation of being one of the friendliest and having the warmest of welcomes towards our visiting brethren. I would like to thank the Brethren of 153, for electing me as their Right Worshipful Master for session 2013-14. When the brethren asked me a year ago if I would consider taking up this office, I felt deeply humbled and honoured. I promise that I will do my best to promote the interests of the Lodge and I hope that my work over the next twelve months will be to the satisfaction of the Brethren of the Lodge. Finally, may I take the opportunity to wish all the office bearers a successful year in office and I look forward to their continued support. I look forward to welcoming you down to the lodge on the 2nd and last Tuesday of the month!